I have had so much amazing feedback about the room I designed that was recently featured in The Globe and Mail! 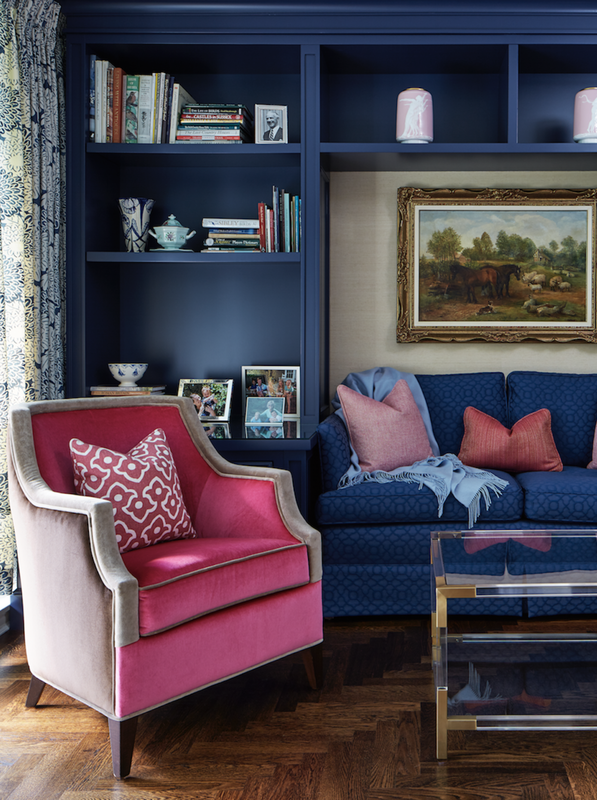 It was part of a condo that I designed for an favourite client who certainly was not afraid of colour! I design a lot of condos here in Toronto, and that market is under great pressure, especially in urban centres like mine. With real estate prices at all-time highs, condos are the solution for first-time homeowners as freestanding homes are out of reach. At the same time, we have the start of the baby boomers moving out of the family homes and downsizing into condos. It is a unique situation where two age groups are after the same real estate product. I’m often downsizing clients from homes that are over 4,000 square feet to 1,500 square feet! Downsizing is a puzzle only the brave take on, but here are my top tips for making that move seamlessly and in style!! 1. Recognize the emotion of the move. Most people who are downsizing and moving into condos are seniors, and this can be an emotional change for them. Selling the family home is always a difficult decision to make. Sometimes an illness of one of the parents forces the timing of the move. Sometimes the family home doesn't make sense because it is a lot to keep up. Editing the family's furniture collection can also be very difficult as there are so many memories attached to each piece. That is where we come in! Our firm is a great sounding board for practicality. We start with explaining the limitations of a condo and some of the issues that might arise. The more informed a client is, the more their expectations are managed, the easier the transition is for them. This is really THE key to making a downsizing move work. The first step is to learn which pieces are non-negotiable. We always keep the key pieces that our clients simply could not part with to start and then we offer other pieces that will not fit to family members first, followed by vintage shops for resale. We always hang on to the pieces that are emotionally most important for the client or the family. It is about emotional attachment, not practicality when downsizing. We find our clients like to keep their dining sets and to us, keeping the table that creates family memories is imperative, so then we need to deal with how that effects the living spaces. 3. Learn to mix it up. The next step is to start mixing in newer pieces. They should stand out and make a statement amongst the antiques and older items. Antiques or vintage pieces give a space credibility. They show history. They share memories. New pieces liven up the space by providing contrast. Use them for a pop of colour, or to add a new softer edge on a table or to act like art in a space - like Tommy Mitchell's accent table with butterflies under Lucite! Often our clients like to add new pieces into their new space and we find they are more apt to select lots and lots of colour! As our clients age, their eyesight starts to fade, so we always layer in lots of lighting and lots of bright colours. We have used hot pink grasscloth wallpaper, bright orange velvet trim, and bright green lampshades! Colour makes a big impact in smaller spaces, so go for it! Use these tips to help downsize your space while updating your style quotient! Drop your email below for exclusive updates & announcements.